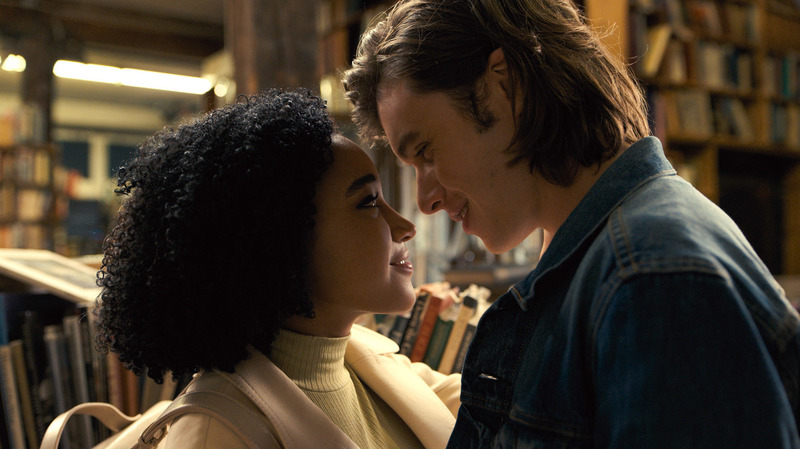 The Device Of Illness Disappoints In 'Everything, Everything' Based on Nicola Yoon's YA novel, Everything, Everything has some of the ingredients it needs to be satisfying, but the way it uses illness only as a plot device makes that satisfaction elusive. Amandla Stenberg as Maddy and Nick Robinson as Olly in Everything, Everything. There's real potency in that hook, especially on screen, which can play so effectively with windows as avenues for voyeurism and self-reflection, not to mention the exquisite tension of would-be lovers on opposite sides of the glass. But Everything, Everything hasn't thought through the implications or possibilities of its premise very deeply. The glass could be a metaphor for virginity or purity on one end and repression on the other, like an extreme example of parents controlling their child's experience or knowledge of the world. And on the most basic level, surely 18 years indoors, without a moment's contact with nature or access to her peers, would have a severe impact on a developing mind. At worst, Maddy Whittier, the afflicted teen played by Amandla Stenberg, could be described as a little bookish and shy, given to daydreaming or losing herself in the imagined spaces of architectural models. Otherwise, she's remarkably well-adjusted and composed: Viewed from behind her panoramic bay windows, she resembles a pristine doll set to be liberated from its packaging, with no assembly required. Maddy owes a portion of her sanity to her mother (Anika Noni Rose) and her nurse (Ana de la Reguera), who are patient and sympathetic, and who encourage her fertile mind to transcend the limits the disease has placed on her existence. Still, there's nothing they can do to keep this hothouse flower from blooming and when Olly (Nick Robinson), a charming and sensitive rebel-type, moves in next door, Maddy starts thinking about risking her life for love. The two communicate at first through glances and pantomime, then a flurry of texts and video chats, but flirtation alone isn't enough for either of them. Maddy is only an inch of glass away from him and a few miles from the ocean she dreams of visiting, and she hopes one day to see Hawaii, home of the humuhumunukunukuapua'a fish. Taking that first step will require an act of equal parts courage and recklessness, like landing on the moon. Stenberg is enormously appealing as Maddy, whose combination of frailty and adventurousness recalls Hazel Grace Lancaster in The Fault in Our Stars, which Everything, Everything resembles in more ways than one. The big difference between the two is that Hazel's terminal illness is grounded in wrenching truths about how parents and friends treat imminent loss and Maddy's SCID is merely a device, no more true to life than Drew Barrymore's reset amnesia in 50 First Dates or any number of body-swapping comedies. And because the disease is not taken seriously, the story doesn't build up the antibodies necessary to protect the film from a ruinous third-act twist. Among the many missed opportunities here is a love story that, in its best moments, is refreshingly open-hearted and earnest, because the stakes are too high for cynicism or empty flirtation. Using SCID as a gimmick feels like attaching training wheels on a bike that should coast along with the help, provided the characters are as appealing as they are here. Everything, Everything is caught in a trap where it doesn't commit to fleshing out the implications of its premise but doesn't have the tools to survive without it. One step into the light and it withers into dust.